The Golf Mk IV GTi with full SEAT Leon spec running gear finally reaches a VW showroom near you on 13th May. 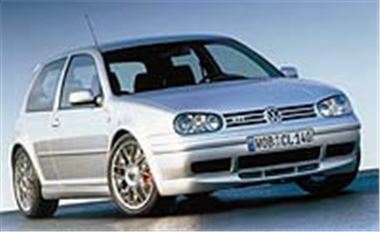 But the extras include 18 inch BBS alloys, unique body kit, roof spoiler, Recaro sports seats, aluminium pedals and, of course, a golf ball gearknob. Instead of the 180bhp turbo, dieselheads can specify the 150bhp TDI which whacks out 236lb ft torque and has the same 138mph top speed as the 180 despite taking you 52.3 miles on a gallon of DERV. This is also the wise buy for company car drivers as its CO2 output is just 146g/km and the price is £18,640. If you’re a Golf fan, get your order in quickly, as it's unlikely that discounters will be able to lay their hands on many of these cars.